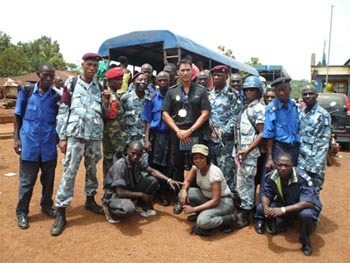 Enhancing the capacity of the Sierra Leone Police to provide basic and quality police services to the community is one of the core tasks in the UN support to national security. To achieve this goal, specific teams shall be deployed to the main SLP Regional headquarters in BO, Kenema, Koidu and Makeni. In accordance with its mandate, professional standards advisers have been providing support to Sierra Leone Police to enhance the professional capacity of the personnel and structure of the force to form integrity, professionalism and accountability within the force. UNPOL officers emphasize the establishment of discipline based on respect to the other members and professional codes as the basic requirement for the desired level of motivation and performance. To monitor, evaluate and promote professionalism and efficiency in all police functions. UNIPSIL Police section has been supporting the establishment of an independent police complaints board. This body will investigate serious cases of police misconduct which are believed to provide the public of Sierra Leone with accountability of SLP and their complaints against the police officers will be seriously considered and dealt with rigorously, fairly. Strengthening the capacity of airport security personnel to interdict the illegal trafficking of such contrabands as drugs, precious minerals, as well as of human beings in and out of Lungi Airport. In the past one and a half years, UNPOL helped build the capacity of the SLP and other law enforcement agents by supporting the elections-specific training of 10,500 personnel. 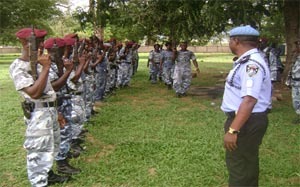 Also 2224 Operational Support Division officers were trained in public order management. 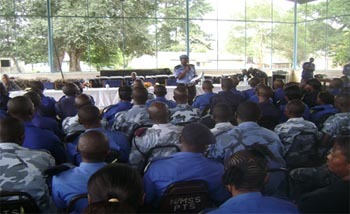 19 Communications Officers were trained on effective communication. Working with UNDP, UNPOLs have been ensuring that the Election Basket Funds support the SLP in ensuring free and fair Elections. Five new HF base radios and 100 VHF hand-held radios handed over to the SLP recently. Also, two new Toyota Dyna mini trucks were procured to strengthen the fleet of SLP vehicles. UNPOL also obtained funds for the SLP, to visit and assess the operational readiness of their Incident Command Centers and Forward Control Points all over the country. In view of the dynamic nature of security threats, regular meetings have been held at the National Joint Operations Center (NJOC) at Murray Town, to assess crime and future deployment of personnel and resources. 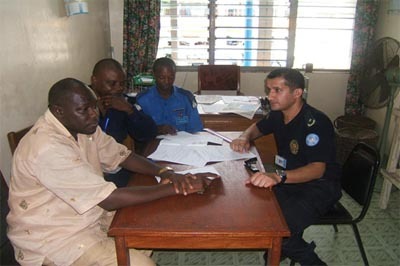 A Threat Assessment Review Group (TARG), was created with members of the Office of National Security (ONS), Sierra Leone Police, Republic of Sierra Leone Armed Forces (RSLAF) and UNIPSIL, and it has been working to provide necessary information on security issues. This will help to prepare a Threat Register. Meanwhile, Local Unit Commanders are being tasked to address issues within their capacity, while the Police Executive Management Board handles more complex issues. 8 Temporary Elections Officers posted to SLP Operational Planning, Bo, Kenema, Kono and Makeni for the duration of the Election period.